With a velvety texture and subtle kick from red peppers—this rich dip will be gone in minutes. 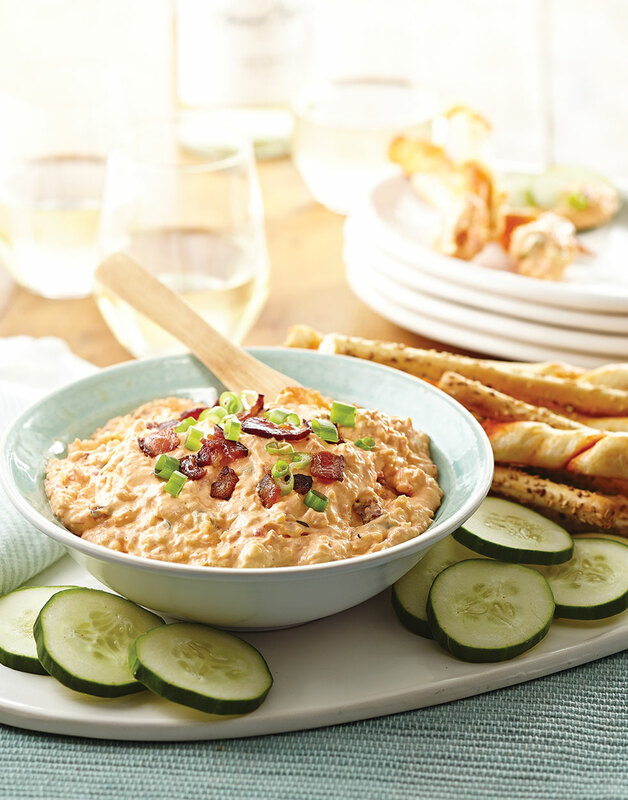 A garnish of bacon and scallions adds a lot to the presentation and flavor of this rich dip. For a healthful dipper, try serving fresh cucumber slices. Blend Cheddar cheese, cream cheese, yogurt, mayonnaise, red peppers, and Tabasco in a food processor until fairly smooth; season with salt. Sauté bacon in a skillet over medium-high heat until crisp; drain on a paper-towel-lined plate. Reserve some bacon and scallions for garnish, then fold remaining bacon and scallions into dip. Transfer dip to a serving dish; chill dip at least 1 hour. Garnish dip with reserved bacon and scallions. Serve dip with bagel chips, bread sticks, or sliced cucumbers.